Mix the butter, shortening, confectioners' sugar, egg, almond extract, and vanilla. Blend in the flour and the salt. Divide the dough in half. Blend the red food coloring into one half of the dough. Shape one teaspoon of dough from each half into a 4 inch rope. For smooth even robes, roll them back and forth on a lightly floured surface. Place ropes side by side and press together lightly and twist. Place the cookies on an ungreased baking sheet. Curve top of each cookie down to form the handle of the cane. Bake about 9 minutes or until set and very light brown. Mix dinner mints and the granulated sugar. Immediately sprinkle cookies with candy mixture. Remove from baking sheet. 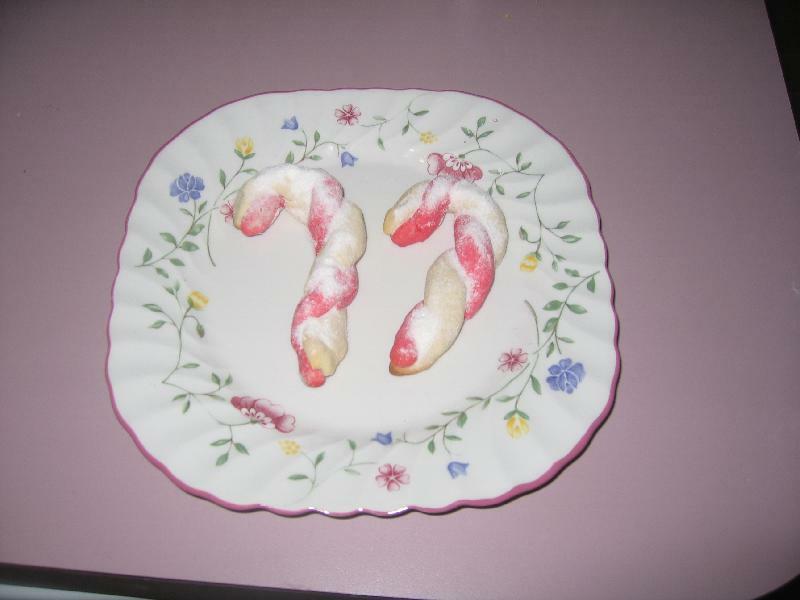 Description: These Christmas cookies are sure to become an annual treat!